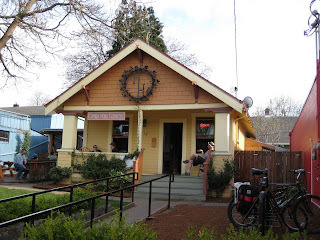 Continuing our tour of close-in SE brewpubs, we come to the tiny but friendly Hedge House (warning: slooooow website) at 34th and Division. It's walking distance from my house, but just barely. More often I'm hitching up my bicycle to their industrial strength bike rack. Back in the fall of 2003 we were really excited to read in the neighborhood newsletter that a New Old Lompoc pub was coming to the neighborhood. Being a newly-transplanted Portlander, I didn't have a long history with the original Lompoc on NW 23rd but the neighbors had only good things to say about it. I'd been in to try the hop-bomb C-Note IPA at least, and heard Dave's story about the keg of Lompoc beer with hop twigs still floating in it, so I was looking forward to having a New New Old Lompoc close by. Somehow we never got the memo when it opened, and it seems like the first time I went in there was the next spring or summer. I asked, "When did you guys finally open?" and got a quizzical look. "Uh, January." Then again, they're not exactly screaming for attention, in an old house set way back from the street, with a small sign in the yard that gives little indication what line of business the house is in. I'm not even sure the sign was there for the first few months; I think you just had to know where it was. Anyway, now we've found it, and the laid-back people and atmosphere make it a great place to pop in for a fresh beer, especially at lunchtime when it's less crowded. You might have to wait for a seat in the evenings, since the interior only seats about 25 people. There's more seating on the side patio, but only part of it is covered and heated. It's one of the more kid-friendly brewpubs in this part of town, since it's more like a restaurant than a bar, and has reasonable mac-and-cheese and sandwich choices for the young'uns. The beer selection is much more limited than at the Lompoc flagship -- only 5 or 6 taps -- and they often seem to run out of the seasonals pretty quickly, though they had the Tavern Rat Barley Wine today, very nice. There's no cask engine, but usually either the Sockeye Cream Stout or the Lompoc Strong Draft is on nitro. A big variety would probably just be wasted on me anyway, since it's hard to talk myself into ordering anything but C-Note. Monday is cheap day, $2 pints. Well, Beervana says they're cheater pints, but at least they're cheap and good. As for food, the sandwiches, soups, and salads are quite good. I especially like the Chop-Chop salad, it's a meal unto itself. Next door is the quaintly continental Pix Patisserie; if the beer selection at the Hedge House doesn't satisfy, Pix has a bunch of clever Belgians in bottles. I called the Hedge House the "second-oldest" Lompoc, because they've added two more taverns to the family: the Fifth Quadrant Lompoc in North Portland, and the Oaks Bottom Public House down in Sellwood. They're all worth a visit -- particularly the Old New Old Lompoc in NW -- but the Hedge House will always be Home Sweet Home for us here in the southeast. Having moved from Portland, not only do I miss the beers, but along with the Bridgeport brewpub, I miss the New Old Lompoc a bunch. Sounds like you were hanging out over in NW. How long ago did you move? Lucky Lab opened a great new place at 19th and Quimby a couple years ago. Check it out if you're back in the neighborhood. It's coming up on 5 years, so that means the old Bridgeport brewpub, before they upgraded.